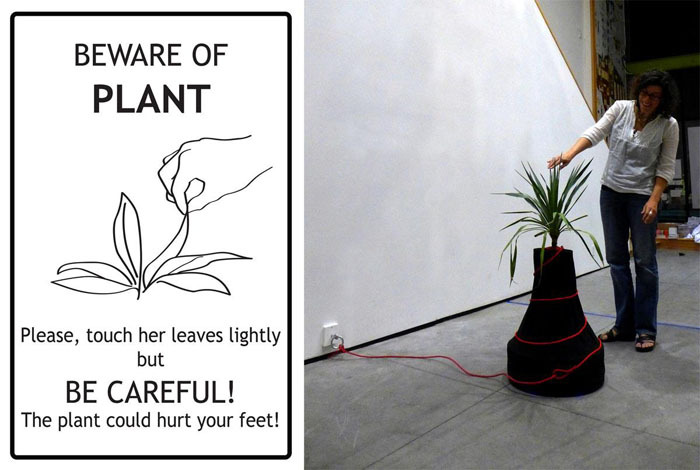 Domestic plant behaves artificially like a wild animal in captivity. It’s an augmented living plant with possibilities to move in the space and to react to human contacts by sonorous expressions. This plant has capacities to interact with it environment, to sense physical dimensions, and to feel strokes of living beings. 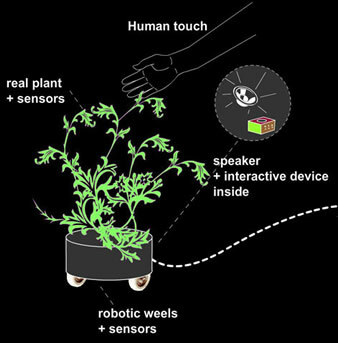 This plant is a kind of cyborg possessing a robotic system for moving. Domestic plant is a plant with animal’s behaviours. It is tied to a leash and has the faculty to move and explore it interaction’s space. Timid, wild, it tries to run away humans who would approach it. When it doesn’t escape us, Domestic plant reacts to the human touch by a sonorous language, a kind of scream. As living being, it is sensitive to our electrical aura, composed of electrostatic energy. In our artwork, we create hybrids between plants and digital technology. 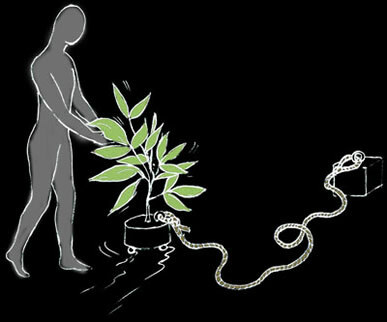 Plants are natural sensors and are sensitive to various energy flows. We display the effects of random data flow and plant interaction. The data is modified as the spectator meanders around and touches the installation, resulting in a movement and a random musical universe. Mixing reality with imagination, we propose a sensory experience that encourages us to think about our relationships with other living things and the environment. Our body continually produces an electrical aura, which cannot be felt. This energetic cloud follows like a shadow and touch lightly and invisibly the environment that surounding us. By making sensitive what escapes to our perception, we want to underline that our environment is not made of inert things, but alive, reactive to our biological influence. 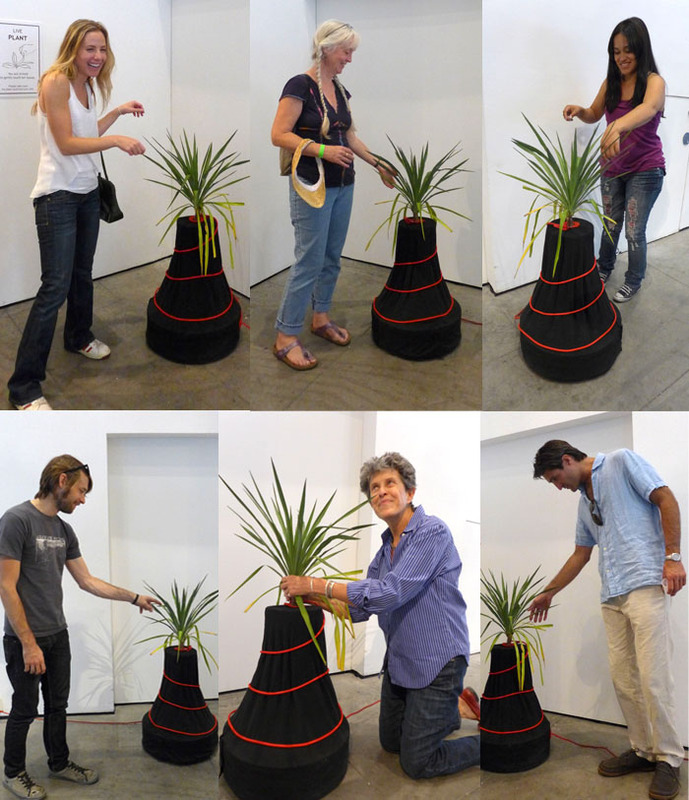 Through Domestic plant, the plant lets us know about it existence by a movement, a scream, an acoustical vibration. 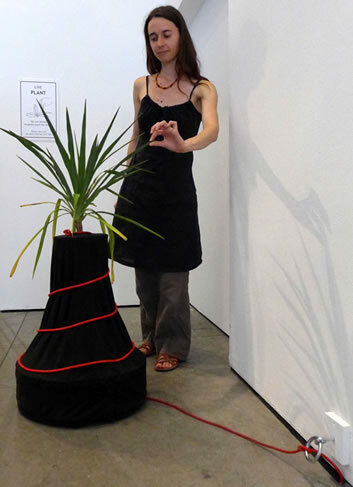 The plant points out its existence by a movement, a cry, an acoustic vibration. When the spectators touch theres leaves this one start to sing. Our approach of the interactivity aims to question our inter-relationships with our social and natural environment through sensory stagings. Through Domestic plant, we propose an ambiguous point of view on our relationships with animal and vegetal nature and on the domestication that leads to kinds of pets or decorative and «living-objects». And then, hybridation between living plant and technology invites us to think about the statut of this «living-object» that is the artwork: in this case, the plant plays an attractive role in a dramatic staging.